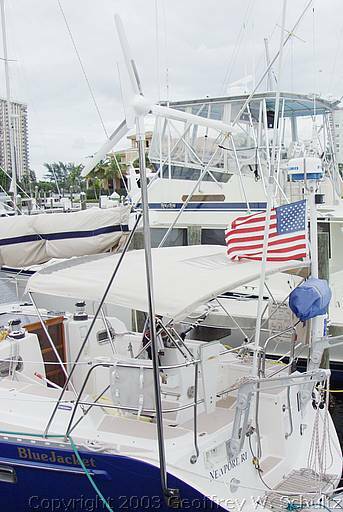 I had an Air Marine windgenerator on my F33/35 mounted on a pole behind the transom. I had two flanges just below the unit with five shock absorbers bolted between the two flanges, but it was still noisy. A helicopter pilot once took a look at the propellor and said the front ends of the blades were too sharp. These should be rounded off to prevent the blade from cutting a new slice of air at every turn, as he described it. That's what caused most of the noise, according to this guy. He advised me to grind the front edge into a round and keep the blades clean of dirt and insects. This all helped a lot. But indeed the new Air X Marine is quieter still. I'm now thinking about either the new Air X Marine or the KISS generator. The developer of the KISS has an interesting way to mount the unit on a mizzen (or main). He uses a very short vertical pole, which makes the unit wobble a lot less. on the mounting ring of the KISS unit, there is a limiter to prevent the unit to turn 360* (aft of amidships), so the blades won't hit the mounting bracket. After all, mounted in front of a mast it will not produce energy well when pointing aft. I found that a very smart thought. Michel Capel, Freedom 44 #4 1981 'Alabama Queen', NED8188, cat ketch with wishbones, home port Enkhuizen, the Netherlands, 52*42.238'N 005*18.154'E. Please note that I split this discussion off of one titled "F39 PHS Discussions" so that people would be able to find it in the future. Personally I hate the AirMarine generators due to their incessant wining. The "X" version is better, but not great. I've moved when I've found myself anchored behind a boat with one. The KISS generator has 3 thermal breakers on the outputs of the windings. These open when the generator gets too warm from generating too much power. On my generator this is at about 18 kts and above, just when the winds are getting to a point where you're generating some nice power. The second effect of this is that there's a switch on the generator which is supposed to feather the blades by shorting the windings (to ground?). The problem is that once a breaker has tripped, flipping the switch generally causes the other thermal breakers to also trip and the blades freewheel. My generator is mounted on the stern, by the wheel, and I don't particularly like having blades freewheeling right above my head. The manufacturer suggests using a boat hook to grab the line that's attached onto the tail and using that to swing the generator into the wind. When you're in a squall and the boat is pitching all over the place, one of the last things that I want to be doing that operation! I managed to snap the tail off of mine when the string got caught in a blade and pulled the boat hook into the tail. Now, if I were to install a new generator, I'd look at the German made Superwind. Here's a link to their web site: http://superwind.com/swe/index.htm. It's more expensive that the KISS, but the blade self-feather and it produces power up to 24 kts of wind, at which time its output goes flat at 350 watts! I've also listened to one, and they're nice and quiet. GeoffSchultz wrote: Please note that I split this discussion off of one titled "F39 PHS Discussions" so that people would be able to find it in the future. Geoff, I thank you for your taking care of us. I sometimes feel like a child when rambling on about off-topic subjects. Thanks for your input on wind generators, very valuable. I've looked at the Superwind too, but find the blade length a bit large. I'd really like your opinion on the new Air Breeze; if you look at the specs, what do you have to say about it? Last edited by Michel on Wed Jul 01, 2009 9:03 am, edited 1 time in total.